As James Bull demonstrated in his recent feature article (March-April 2005 CI, p. 13), the Union Journal Pure and Applied Chemistry—of which he is scientific editor—is getting some attention these days. Not only are the contents of the journal garnering interest, but also its format and online availability. The year 2005 is seeing many changes in the journal production workflow, starting with the full implementation of the online submission and peer-review system (March-April 2005 CI, p. 24). Also, starting with the January issue, all metadata for the online edition are generated using a new procedure based on the extraction of information from the files produced for the printed edition. All HTML abstract pages have up-to-date format classification XHTML 1.0. The ability to harvest these data, coupled with further programming, now allow the journal to take part in CrossRef. CrossRef is a collaborative, cross-publisher reference-linking service that turns citations into hyperlinks, allowing researchers to navigate online literature at the article level. CrossRef is a wholly independent association of scholarly and professional publishers—large and small, commercial and non-profit, traditional and non-traditional—that cooperate to provide reference links into and out of their electronic content. As such, CrossRef serves as the citation linking backbone for all scholarly literature online, facilitating and transforming the flow of information. As a small publisher with only one journal, IUPAC made the decision to participate in CrossRef recognizing the benefit of increased accessibility and visibility. Given PAC’s limited resources, the practical implementation took some time, but the engagement and will of Bohumir Valter was instrumental to the entire transformation. His service to PAC, provided through Documents Data Services, supplements the existing work performed by the production editor Cheryl Wuzbacher and Cheryl Bush. As Bohumir Valter mentioned, a lot of work is still required to get PAC fully integrated in CrossRef, but step-by-step the modification of the journal workflow and the site will take place. While we are making progress with improving the current production of PAC, one should also note the steady progress we are making by posting older issues of PAC online. In mid-February, a milestone was reached with 25 000 pages of PAC scanned. 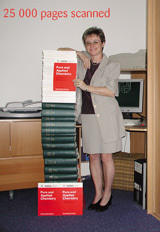 Document Data Services started this project in fall 2003, following the recommendation of the Committee on Printed and Electronic Publication at its meeting during the 2003 General Assembly. The restoration process includes black and white scanning at 600 dpi and 300 dpi for pages with color and halftone figures, TIFF conversion to searchable PDF, indexation of the scanned article, and also rebinding of the original paper copies. To keep quality assurance of the archive, all digitalized pages are reviewed and manually retouched if needed. The resulting files are archived on CD and made available on the PAC web site. The project will be completed in 2006.